Blackfoot. A small-time city directly in the heart of Bingham County. Here at the Group Real Estate, we love to highlight a few of the surrounding areas that we help with listings and buying. Blackfoot bolsters the largest potato industry in any one area, and is, due to this fact, appropriately named “Potato Capital of the World.” Due to this very fact, the history of the potato farmer and the city being the capital is showcased at the Idaho Potato Museum, where you can aptly learn about the history of the potato and the Blackfoot area. Blackfoot is also the home of the world’s largest baked potato and largest ever potato chip. Another big attraction that brings in so many from around the Western side of the United States is the Eastern Idaho State Fair. A fun, and engaging, environment for all ages. Rides, treats, fired foods, rodeos and the appropriately managed 4-H show off, which gives kids the chance to, not only show off their prized possessions, but teaches them a powerful work ethic. Blackfoot is just to the south of the Snake River and a part of the designated Snake River Valley. It was designated the County Seat in 1885. After a battle for what should be the county seat, between Eagle Rock (now known as Idaho Falls) and Blackfoot, was won by Blackfoot, due to Blackfoot men bribing the erasing of the word “Eagle Rock” and replacing it with “Blackfoot.” This started an uproar and accusations started to fly. The newspaper editor in Blackfoot learned of the event and went public with it. This created a nasty, political tug-of-war between the Legislature in Bingham County at the time, between Eagle Rock and Blackfoot. Once Eagle Rock found out about the back-stab style with how Blackfoot won Country Seat, they decided to take it back through legislation. A man, by the name of Fred T Dubois, a known Anti Mormon, Yale graduate, started a political battle to turn the tides and keep the County Seat in Blackfoot. In 1866, Frederick S Stevens and Joe Warren filed claims to the Snake River Valley, and ultimately settled what is known as Blackfoot today. In an area that was still populated with Indians, the settlers that came to Blackfoot, lived sparsely and weren’t as unified yet, due to the Indian threat. The area was a flat, expansive land filled with a lot of sagebrush, with room to cultivate, farm and grow. With such a strong Indian threat at the time, Joe Warren created holes in the cabins built and had them guarded, round the clock, until the Native threat was weeded out, and nonexistent. The planned township, where Blackfoot resides now, was just two miles from the Blackfoot river and roughly one mile from the Snake River. It was called Blackfoot by the fur traders who resided there at the time. If you travel along the Snake River today, you will notice that it is lush with green trees, grass and flowers. When Blackfoot was first settled, they made sure to build irrigation from the Snake and Blackfoot Rivers to cultivate thousands of acres worth of land. They would plan excursions to go on ventures through the Snake River areas to see such a wonderful contrast between the beautiful greenery near the river and the gray look of the sagebrush land. Due to this stark contrast, the area near the Snake River was dubbed “Grove City,” as you would literally walk from gray land into a lush grove of trees and shrubbery. 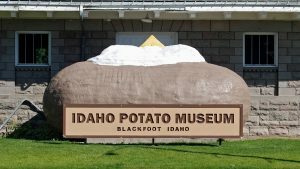 Not only do you have this awesome back story, seeped in Cowboy style culture, but even now as you go to Blackfoot, it sits so close to the beauty of the Snake River, has some fun places to go and visit, one of them being the Potato Museum, and bolsters the Eastern Idaho State Fair! Another main attraction for Blackfoot is an eatery called Rupes. This is a diner that needs to be experienced by all. An old school locale, where you can park your car just outside the restaurant and have the waitresses, or waiters, bring food out to you on skates. They are known for amazing shakes and even better burgers. Do yourself a favor, as you visit Blackfoot, stop at Rupes. As you look for a place to call home, Blackfoot is the place to look. Close to so many different attractions, whether it be jet skiing on the lake at Jensen’s Grove, playing in the canals, boating and fishing down the Snake River, going to the Potato Museums, and being so close to the mountains for hiking, horseback riding, and 4 wheeling. Blackfoot’s old-school culture is the perfect place to call home.